I am writing to you as a local rail user and on behalf of Acocks Green Neighbourhood Forum. Obviously the staff can offer advice and help on using the train network, reassurance to those who are not regular commuters and also offer a sense of security. For example I know from experience that many people have no understanding of the Permit to Travel machine and find it most confusing. Some train users would also feel isolated waiting alone a platform with no staff at hand. When there is a member of staff in place it encourages more people who are ad-hoc passengers to use the train. It makes people feel more secure and confident in using the service and also parking at the station. The staff are a friendly and personal representative of your service in this more and more anonymous digital world. We are sure that everyone would agree that to have face to face contact with a knowledgeable and reassuring railway representative makes their journey more complete and pleasant. We feel that less people will use the train service in the afternoon and evening if there is no staff member to serve them. We want the train service to be a well-used and beneficial service to everyone in the area. To lose the staff may save your company money in the short run, but it does not reflect well on your service. We are being encouraged from all sides use more sustainable transport and yet your proposals are not supporting users of a sustainable service. We speak on behalf of many local people and hope that you can reconsider your proposals. 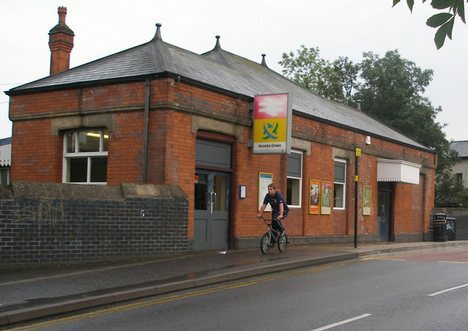 Thank you for your email of 16 March 2011, regarding London Midland’s (LM) proposal to reduce ticket office hours at their stations. We are reading and recording all of the emails and letters sent to us on this important subject and recording all the rissues raised. 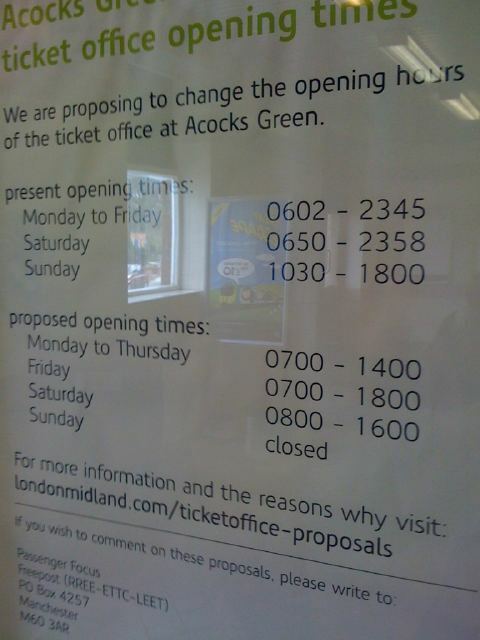 Under the guidance governing ticket office opening hours, a train company can reduce opening hours if the office is lightly used. Less than 12 ticket sales per hour is the cut off point. We are checking LM data to ascertain the level of ticket issues at the offices where they are proposing to reduce opening hours. In addition we are looking at all potential loss of benefits and services that will affect passengers. We will also be monitoring carefully the measures where LM are planning to provide additional benefits for passengers. Thank you for your comments and for contacting Passenger Focus. This entry was posted in Events and tagged Acocks Green, customer service, London Midland, opening hours, passengers, proposals, public transport, sustainable transport, ticket office, train station. Bookmark the permalink. Closing at 1400 only makes it harder for people who work 9-5 to speak to someone real! Many thanks for writing, and updating us! I believe Passenger Focus have one week until Tue 29 Mar to lodge any objections themselves?